Making enjoyable, amazing homes while cutting back on unnecessary square footage and cost is the bottom line of what we do as home designers. The More Home Less House design philosophy is based on the twofold purpose of designing beautiful spaces for a home while minimizing costly inefficiencies. Here is a list of the basic "rules of thumb" that define our design philosophy that can be used by anyone looking at building or remodeling their dream home. All homes have a heart. Think of a house you enjoy and you will most likely find a place that stands out for being inviting and welcoming. We can visualize this place as having the magnetic quality of gathering people around it. If you ever attended a party where guests gravitate to the kitchen island and not to the place set by the hosts, you have experienced first hand the magnetic quality of the heart of a home. When people feel overwhelmed by the many complex decisions to be made when they want to build or remodel a house, we recommend they focus on the heart of the home first. The dining room, the screen porch access and a bench around the island are part of the heart of this cabin. Defining the heart of the home is the best way of setting spending and location priorities; in this case it not only has unique views but also the best furnishings and finish materials. The next step after defining the heart of a home is to think about the experience of entry, passage and arrival to it. 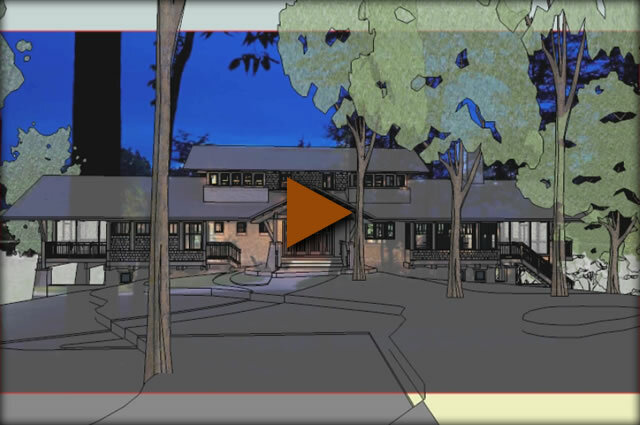 For example, the arrival at the heart of the home can happen suddenly or it can be a gradual experience defined by a sequence of spaces such as a foyer, a stair, and a corridor, as shown in this short video of a new home we designed close to Ledges Park in Boone, IA . Clients tend to describe the needs for their future home in terms of rooms. This was the case when our clients asked us to add a library to the cabin we were designing for them. We encouraged them to describe in more detail how they were planning to use the space, and refrain form calling it "library". It evolved into a place for the books they read at night and a place to sit and read kids' books before going to sleep. Describing their reading habits without associating it to a specific room inspired us to create a unique space for their home: a library integrated into the stair that became a focal point for the heart of the home. By challenging ourselves to integrate the activities we want in our future home we can create more interesting spaces with less square footage. 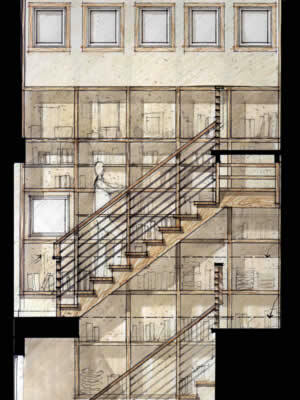 The previous stair and library is a good example of two different activities that when shared increased the quality of the space and decreased the size and cost of the house. The image shows how this design approach becomes a win/win situation by simultaneously improving the beauty, the cost and the environmental impact of the home. The success of Apple products and the surge of the Design Economy in the past decade have helped to promote the value of design in our lives. Perceived by many as a way to add cosmetic beauty to a house, design has evolved to be a vital part of how we live our homes today. In the same way that the design of an iphone is based on "how it works", the homes we design don't just look good but are designed to accommodate customer's comfort and lifestyle. If you have a project in mind and are interested in the More Home Less House design approach don't hesitate to contact us. If you are curious about the More Home Less House design principles you are welcomed to join us in one of the short courses that we teach regularly.